I decided to build my curved screen out of wood for several reasons. The first was cost. Often 2-inch square aluminum tube is used for such a frame. The material cost for aluminum was rather high, plus there would be the additional cost of sending the tubing out to have it bent into the proper curve. 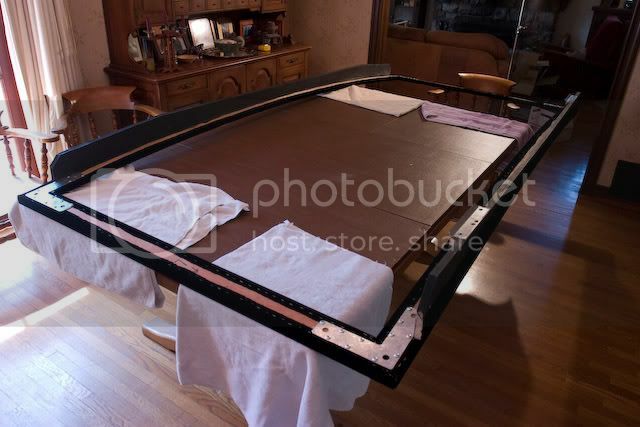 Second, a wooden frame would allow both the black velvet and screen material to be secured with staples, rather than a more elaborate mechanical fastening system of some sort. Third, I liked the aesthetics of a wider, shallower frame member over the boxy 2 x 2 aluminum profile. SeymourAV, from where I purchased the AT screen material, has a very good download of instructions on building a flat AT screen. 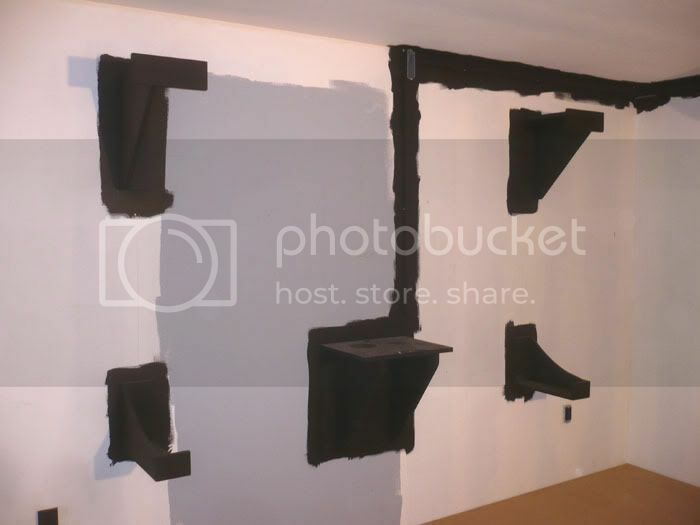 I liked their basic methodology of the structural frame getting wrapped in black velvet and forming the masking border as well. I followed their instructions, just substituting curved members for the frame top and bottom. The finished screen will measure 48 x 113 inches (122 inches diagonal) 2.37:1, curved to a radius of 40 feet. 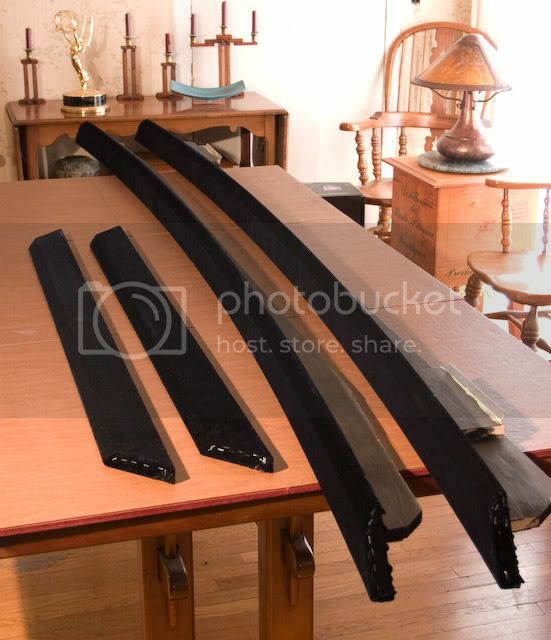 The screen members would wind up being 1 inch thick by 3 1/2 inches wide and would be laminated together out of five layers of 1/4 inch thick Luann plywood. Like most plywood, Luann is slightly undersize in thickness; the five layers stacked up measured almost exactly one inch. 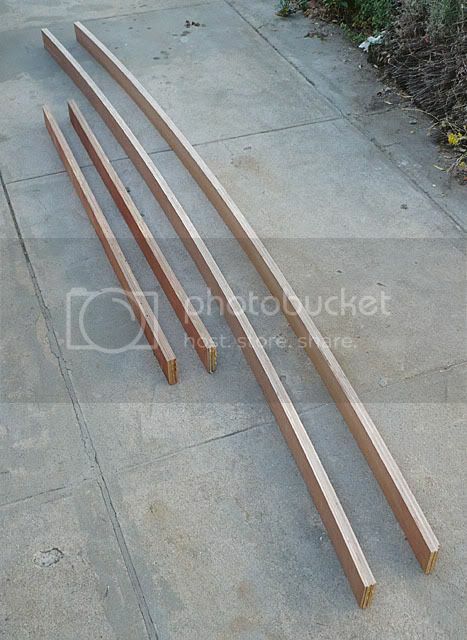 Luann is an inexpensive imported mahogany plywood. In hindsight, it might have been better to use a better quality material (less flex) but at the time, the Luann was all I could find in a ten-foot long sheet. 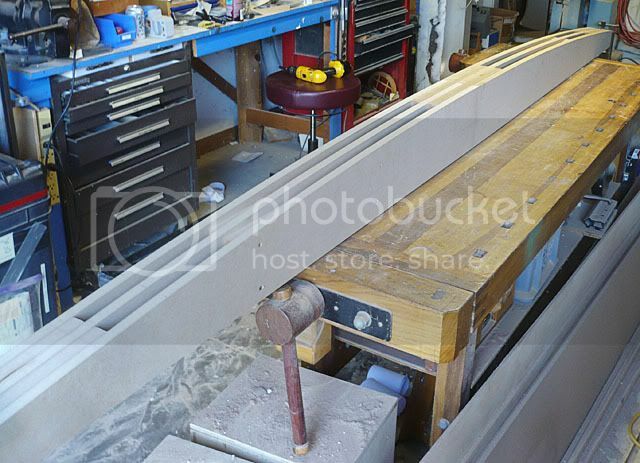 The Luann was cut into 4-inch wide strips on a table saw. 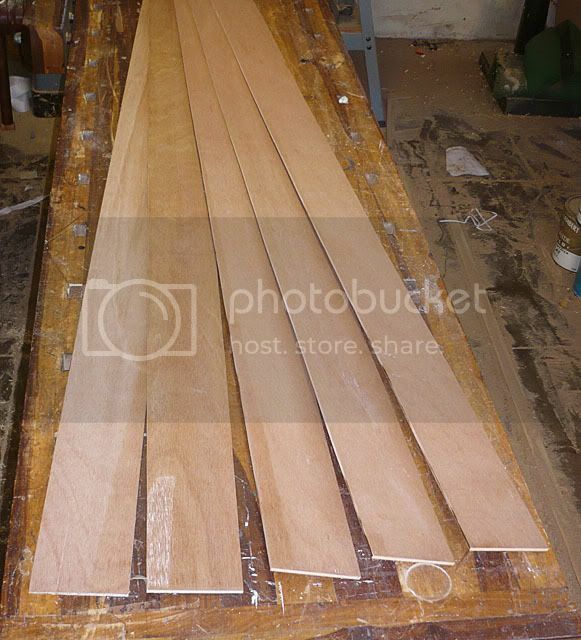 Once laminated together, the pieces would then be cut down to the finished width of 3 1/2 inches. I built up a clamping form to the proper radius from MDF (Medium Density Fiberboard). The form was 10 feet, 2 inches long and just over 4 inches wide. 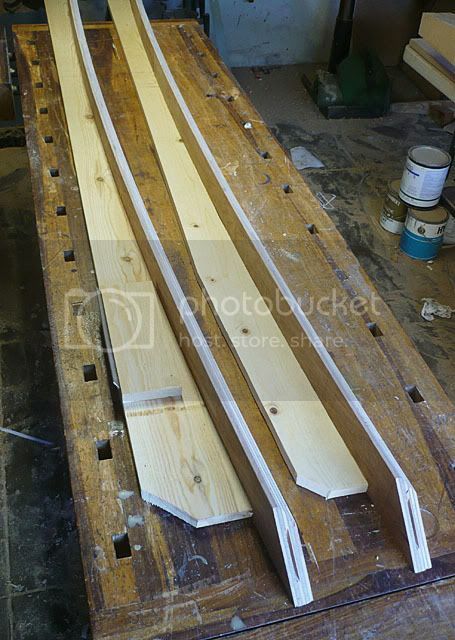 Here one set of the strips have been coated in glue and clamped to the curved form. 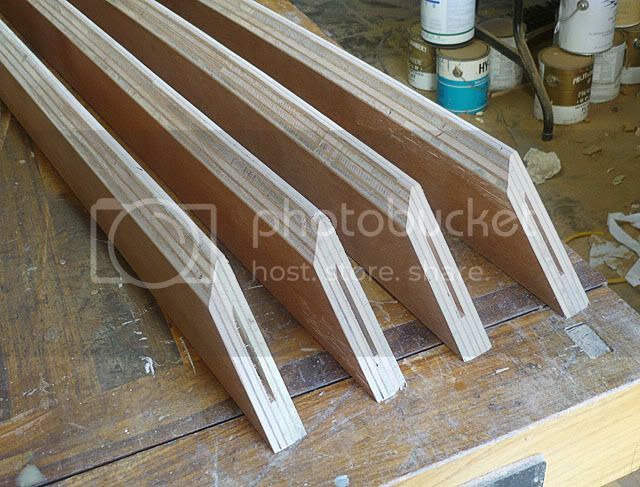 I used Titebond Extend glue which has a longer working time than regular woodworking glue, giving me enough time to get all the pieces clamped together before the glue starts to skin over. The form was covered with waxed paper to prevent the striped from getting glued to it. The clamped assembly was then left to set overnight. The untrimmed laminated frame members. The straight sides were just glued up clamped to a flat piece of wood. Good way to go if you have clamps already. Looking foward to seeing your finished product. Continue to post lots of pics. Also how'd you get such a smooth and even cut on the MDF. I'm probably going with a 2x6 approach similar to others here and that curve reversed on the MDF seems about perfect. jeez, it would cost me more to buy enough clamps to do that project then it would cost to buy a screen! 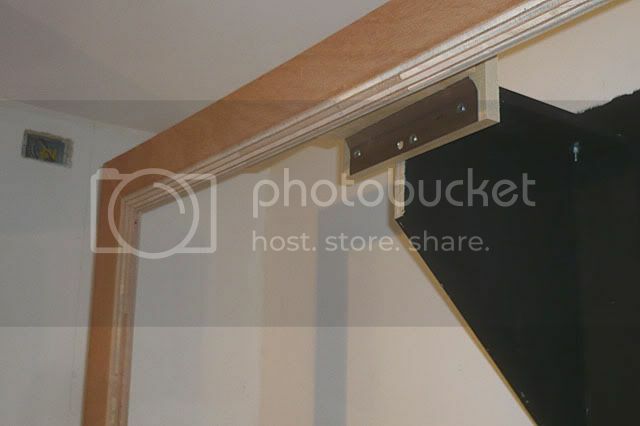 Your woodworking skills are excellent, neat DIY project. I'm sure you are looking fwd to watching 2.35:1 on this, keep posting your build progress. It looks like a professional workshop. You really know your wood working stuff. All the best for your project and look forward see the final product. 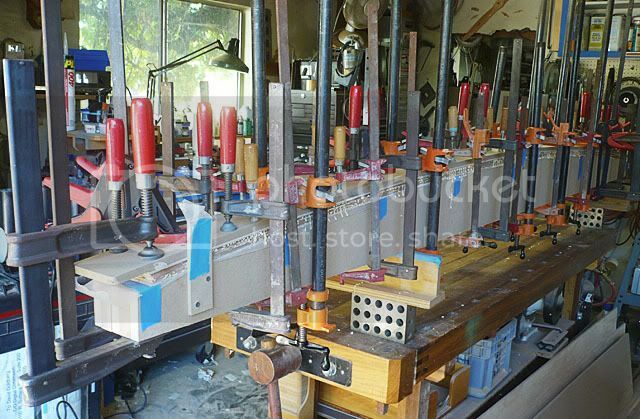 Yes, it definitely helped having all those clamps, acquired over the course of 30+ years of woodworking. It could be done with fewer clamps by beefing up the unglued strip of material laid along the top of the sandwich to distribute the clamping pressure. I used 1/2 inch MDF. The curve on the form was done by having a full size pattern printed out at my local blueprint house. That was then spray glued down to a sheet of 1/4" MDF which was cut out and sanded to the required curve. That pattern was then used as a routing template (with a flush cutter router bit) to cut out at the layers of 3/4" MDF which were then sandwiched together to make the clamping form. It's fairly labor intensive but materials cheap. Here's a breakdown of what the screen is costing to build. You can see that the frame itself is pretty cheap, the screen material and velvet represent over 2/3 of the total cost. oman321 - Too bad you're in Massachusetts. I still have the clamping form and would sell it for dirt cheap to someone that could use it, but I'm in Southern California. I was wondering where you were out of. That's ok though at least it gives me another idea of how to go about it. Once the laminated part cured I ripped them to a width of 3 1/2 inches on the table saw. The inside edges were beveled with a 45 degree router bit. The corners were mitered and slotted for plate biscuits that would help keep the joints aligned. The ten-foot long curved frame members wound up having a little more flex than desired (maybe due to the Luann plywood) so I added curved ribs cut from 1x6 pine to the backsides. 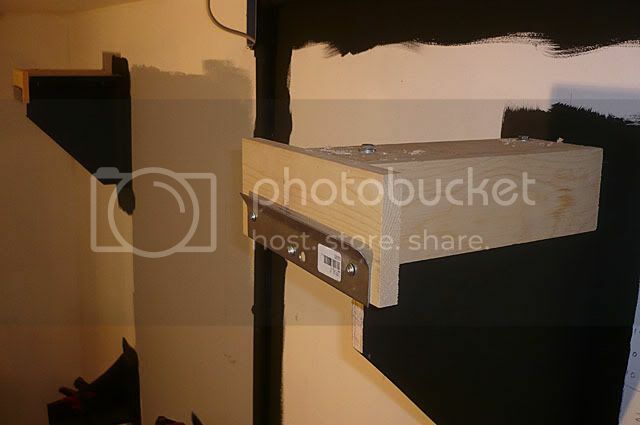 The piece on the left also has added blocks for the metal French cleat hangers. 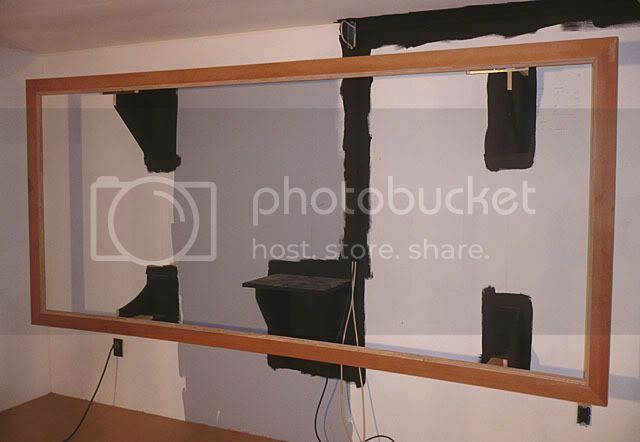 Here is the screen wall with the screen support struts and a shelf for the center channel speaker. Test assembly and hanging of the screen frame. I had to change the mounting struts, making them adjustable, to allow the metal cleats to be lined up straight and level. Where'd you get the metal cleats? 8 bucks for an 18 inch long pair. I cut them in half with a hacksaw. WOW....thats quite overwhelming for me, I think I have decided over the past week or so to go with the flat screen, I dont have much room to play with, but that was one heck of job man....I wish I was half as good as you, the curved frame looks amazing! Did you end up buying the 63" cut from Chris (SeymourAV) or the 98" cut? it sounds like you are using a 120'x50' 2.37:1 screen. 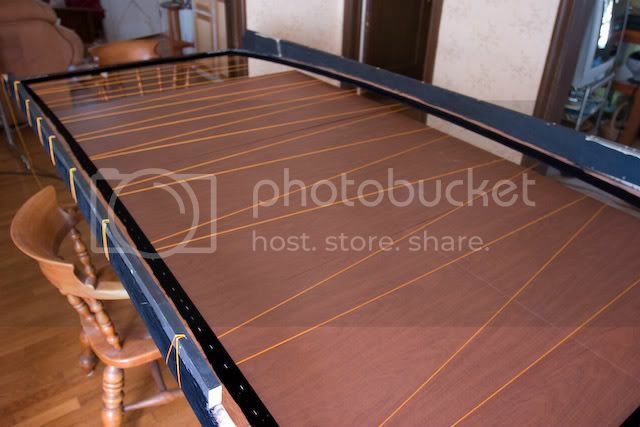 I will be attempting something around the same size, possibly a little bigger (11x5.5), and I am wondering if Chris was able to make the 15 degree cut for your screen size out of the 63" roll, money wise it sounds like you ended up 63" roll which was good enough for the angled cut. Just curious. Thanks for the compliments. It's been really fun to make the screen, especially when the fram was assembled for the first time in the theater. It looked big in my shop but it looked REALLY BIG in place! Hey, size matters! I had to go with 11 linear feet of the 98" wide material from Seymour AV. I had Chris cut it on the 15 degree bias for me. Figured it was worth the extra 30 bucks not to have to clear and clean a space large enough to lay out the raw material. Good luck on your screen! 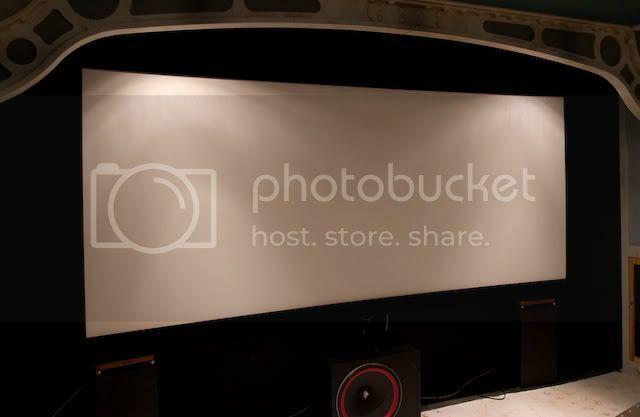 Finally now that all the messy work is done in the theater I can finish the screen and get it in place! The frame has been complete and sitting to the side for several weeks now. First I wrapped it with black Fidelio velvet. The velvet came fairly wrinkled, not enough to have ruined the surface but more than would be possible to stretch out. The seller recommended misting the back of the material and letting it dry. This smoothed it out a bit but not completely. Ironing velvet is a big no-no as it will crush and ruin the nap of the material. Fortunately, my fiancee has a garment steamer which worked like a charm. Stapling the velvet to the frame was fairly straight forward, just be sure to pull it nice and tight as you go. The mitered ends were a little fussy to do but eventually turned out fine. 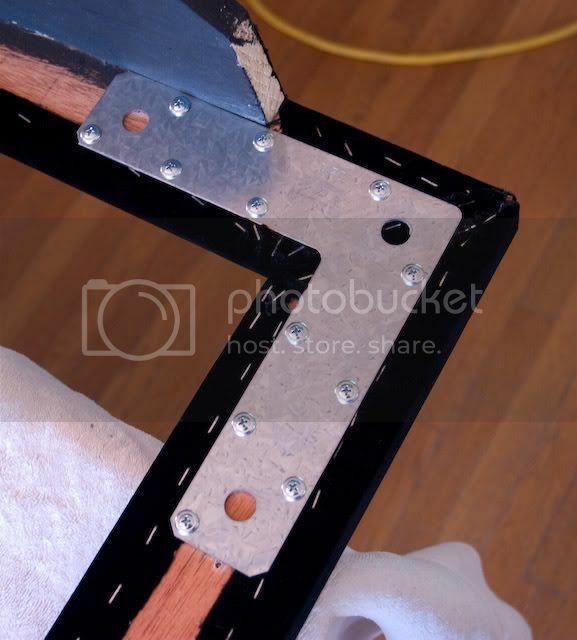 The frame was assembled using heavy duty angle plates in the corners. The wooden biscuits proved to be unnecessary as the angle plates held the corners in alignment just fine. I was faced with a bit of a dilemma is how to handle the screen material. 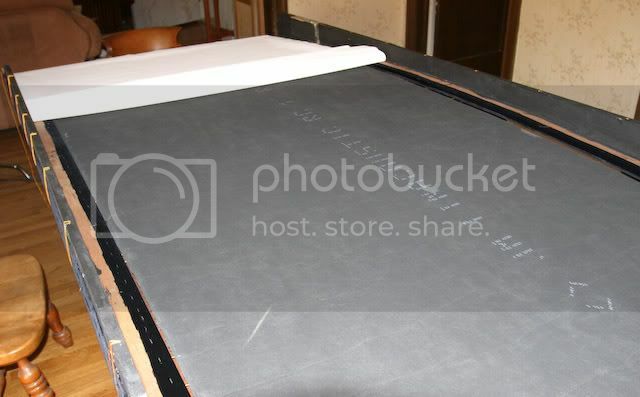 Chris Seymour's DIY tutorial recommends laying down some sort of sheet material equal in thickness to the frame on which the screen material can lay preventing the material from sagging. Hmmm, how to do that with a curved screen? The answer was to stretch and staple a strong cord back and forth across the face of the screen. I used some mason's line which I happened to have on hand. On top of that I lay down some left over 1 inch Linacoustic insulation which more or less came up flush to the back of the frame. The screen material was then rolled out on top of that. It did sag a bit but overall made the stretching and stapling of the screen material much easier. The finished screen in place. There are still to be curtains framing the screen. Man! That looks nice :O ! how hard was it to wrap the velvet on the mitered ends? i will be trying this fairly soon. did you cut the ends so it didnt overlap itself on the back? or did you just fold it up in back nice and tight and staple it? Turned out really nice, looks great. Is that metal frame support in front of the screen decorative or actual structure, looks pretty cool. The beam you see is one of the decorative beams in my Nautilus themed theater. It looks structural but is in fact made out of medium density fiberboard. In my signature is a link to my construction blog. I was checking out your blog. I don't know if I can say that I like it... Cause I have to say that I freakin love it... That is awesome work man, very nice. I don't know if you ever posted in the Room Construction-Dedicated Theater part of the forum but I know the guys over there would to see it. Great stuff man keep it up. The curved screen counters the pin cushion distortion inherent in projecting through an anamorphic lens. I've not installed a lens yet so at present I have to use the zoom and lens offset lever to switch between 16:9 and 1:2.35 which is a pain. So I've not been able to fine tune the adjustments and take any screen shots. A by product of having a curved screen is hearing "Wow, Dude! You've got a curved screen? Cool!" Hey Bungalow, would you mind letting me know how you came to the decision as to the raduis of the curve of the screen? What made you decide on a 40 foot radius versus some other figure? I just finished reading through your Nautilus Screening Room thread and was amazed. Your attention to detail must obviously carry over to your professional life as well, as that looks like an Emmy on the sideboard. Congratulations and thanks for sharing both threads. There's a reason they're called the fine arts--buy them on blu-ray. I was thinking about making my next screen curved. Why is this screen based on a 40ft radius? You aren't really planning on having the projector that far away are you? I figured that the radius should be the actual distance that the projector is from the screen. 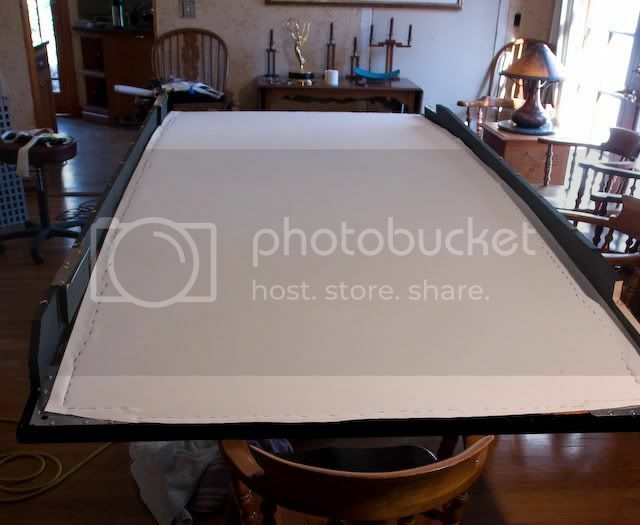 I drew up in AutoCAD that with for me with a 110" screen with my projector 11ft away I would need a 12 inch deep frame. That will simply not work for my current application. The radius is not based on the distance of the projector to the screen but rather a more complex formula designed to reduce or eliminate pin cushion distortion. It is also different if you are using an anamorphic lens attachment or going with the zoom method. I figured mine out the old fashioned way, string, tape and a broomstick. If you post a request on the CIH forum I think you can get a copy of a spreadsheet one of the members made to calculate the radius. I downloaded AussieBob's spreadsheet which calculated a 40.4 foot radius, I came up with 40 feet the old fashioned way. Pretty darn close!